I was intending to write for this site on a ‘once a week’ basis, but as every week seems to be bringing more than one thing of interest, and many things requiring more pondering, more frequent additions sometimes seem appropriate. So we’re back at Clifford’s Tower. And, specifically, studying that image at the top of the page, a ‘bird’s eye’ view from Bing maps. Obviously not a familiar view of the site unless you have the power of flight and permission to fly low over Clifford’s Tower. It is rather striking, isn’t it. It illustrates very clearly just how dominant that car park is, on one side. So dominant that it seems to cut in to what looks like it should be a green grassed area matching the other side. It’s unbalanced. On the left is a flat grassed area around the mound, giving breathing space and a suitably respectful setting for this important monument. To the right, the tarmac extends right up to the base, with no ‘apron’ of grass. It looks really crass and intrusive. Obviously as many parking spaces as possible were fitted in when the land became a car park. A story in the Press earlier this week picked up on comments made by city archaeologist John Oxley, on Facebook, regarding the car park. It also came up in a discussion on Twitter the same evening. It’s widely accepted that the car park looks rubbish and completely spoils the setting of the tower. According to a recent Press report, ‘council executive will be asked later this month to approve of the sale of a small area of land to English Heritage, to allow the building to be constructed.’ It does beg the question, if one bit around one side can be sold, why not a bit of the car park, round the other side? 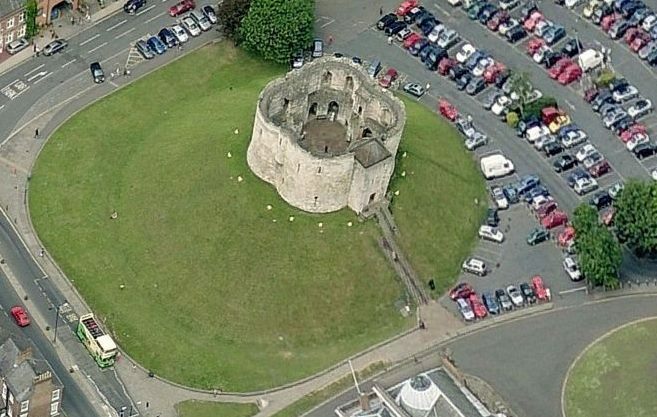 Why can’t City of York Council release just part of the car park land, enough to put some green ‘breathing space’ to the right of the mound to match the amount of space on the left? And enough to erect the proposed visitor centre? 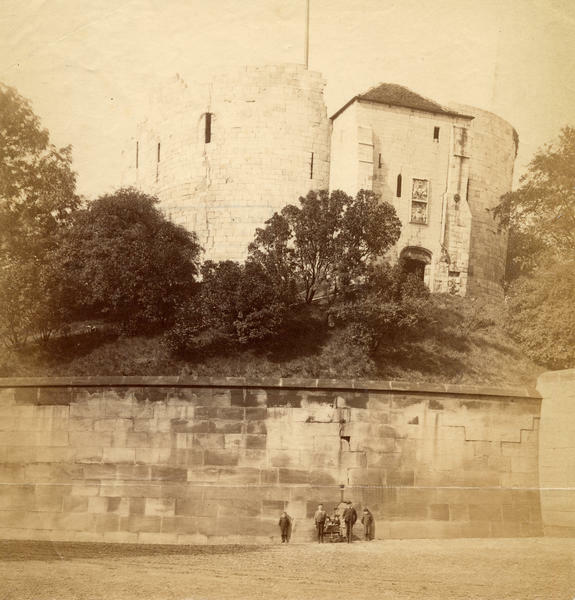 Anyway, I’ll leave you with another photo borrowed from the city archives, in which some former residents of the city stand by the huge walls that once stood on the site, helpfully giving a sense of scale. I hope the awareness is spreading that our ‘iconic views’ around this side have only been that way since after the mid-1930s when these walls were pulled down. So many people now treasure the view from Tower Street, radically changed from how the area looked when the photo above was taken. Which suggests that the city authorities did a good job back in the 20th century in the landscaping of the site once these walls were gone — on this side at least. Perhaps the 21st century should try to match that, with a sensitive approach on the other side, removing some of the car park tarmac. Meanwhile, word reaches me about a plan for nearby Piccadilly … something about shipping containers. Must go and read more about that. The report on the ‘Southern Gateway’ plans for the area referred to in the Press articles linked to in the text above can be found here (PDF) (report dated 29 Oct 2015). Connected with the above, a site map showing ownership of the parcels of land making up the ‘Southern Gateway’ area is buried in the middle of a very long document (p217? ), and may be of interest: PDF on this link.